Although commonly found in wooded areas, ticks can be found pretty anywhere because they are carried by the birds and other animals they feed on. In Canada, we have approximately 40 species of tick, but fortunately for us humans, only a few of them can transmit Lyme disease. Below is a quick guide to some of the most common ticks in Canada. Please note: All tick images found on this website were kindly provided by the University of Alberta, and are reproduced here with permission. Please visit the U of A’s website for additional information and more detailed image galleries. 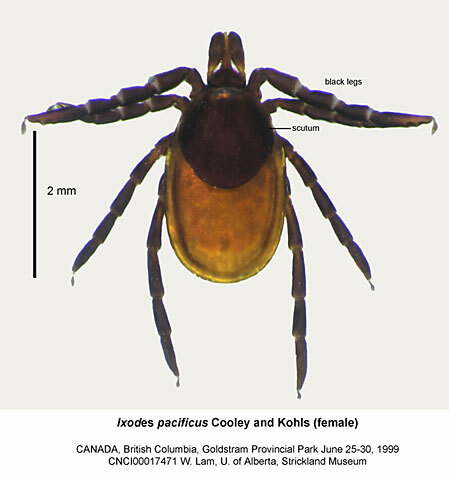 The Western black-legged tick (Ixodes pacificus) is the second most common Borrelia-carrying tick in Canada. As its Latin name suggests, this tick is found mainly on the Pacific coast. View top and bottom aspect of tick. Although this tick’s ability to transmit Lyme disease has been debated, recent lab experiments have demonstrated that it can transmit Borrelia burgdorferi and B. bissettii. So if bitten by this tick, it’s still very important to be treated immediately. Although the Lone Star Tick (Amblyomma americanum) has been shown to transmit Lyme borreliosis (Borrelia americana and Borrelia andersonii), it can transmit other infections such as Ehrlichia and Tularemia. In addition, victims bitten by the Lone Star Tick will occasionally develop a circular rash, similar to the rash of early Lyme disease. The rash may be accompanied by flu-like symptoms, and this condition has been named “Southern Tick-Associated Rash Illness” (STARI). STARI is treated with oral antibiotics. Newer research is now associating a Lone Star Tick bite to a mammalian meat allergy. 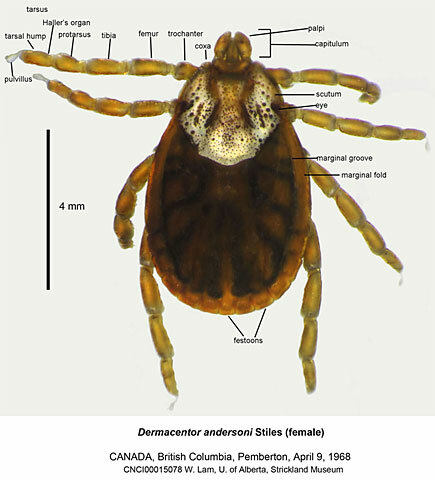 The American Dog Tick (Dermacentor variabilis) is also a common tick in Canada, and can be found from Saskatchewan east to the Atlantic Provinces. This tick can transmit Rocky Mountain Spotted fever and Tularemia, but is not normally associated with Lyme disease. The brown dog tick (Rhipicephalus sanguineus) has been shown to carry Borrelia, but their ability to transmit the bacterium to humans is still in question. The brown dog tick can transmit Rocky Mountain Spotted Fever. The Rocky Mountain wood tick (Dermacentor andersoni) is known to transmit Rocky Mountain Spotted Fever, Tularemia, Colorado Tick Fever, and is a major cause of tick paralysis. View top and bottom aspects of tick.